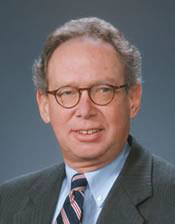 Gary Stern was president and chief executive officer of the Federal Reserve Bank of Minneapolis from March 1985 to September 2009. Stern, a native of Wisconsin, joined the Federal Reserve Bank of Minneapolis in January 1982 as senior vice president and director of research. Before joining the Minneapolis Fed, Stern was a partner in a New York-based economic consulting firm. Stern's prior experience includes seven years at the Federal Reserve Bank of New York. Stern serves on the board of directors of the Depository Trust and Clearing Corporation, and the Council for Economic Education (CEE), where he served for a time as acting president and chief executive officer. He formerly served as chair of the boards of E*TRADE, FINRA, The Dolan Company, Ambac Assurance Corporation, the Northwest Area Foundation, the Minneapolis Club and Blue Cross Blue Shield of Minnesota. He was also a board member of the Minneapolis College of Art and Design, Hamline University and ETS. He also has served on the faculties of Columbia University, Washington University and New York University. Stern is co-author of Too Big to Fail: The Hazards of Bank Bailouts, published by The Brookings Institution (2004). Stern holds an A.B. in economics from Washington University, St. Louis and a Ph.D. in economics from Rice University, Houston.